Patsy Cline and Lady Gaga Duets! I came to this insight the other night, when Jeff took me to see the musical “Always…Patsy Cline” at St. Michael’s Playhouse in Colchester, Vermont. The two singers could not be more different. Patsy was the ultimate real person, singing genuinely about heartache and love. The play, very much worth going to, by the way, was based on a true story of a friendship between Cline and a Houston housewife who was a big fan. The characters were as down to earth as the ground you walk on. Lady Gaga is the ultimate example of artifice: all flash, makeup, schtick and plastic. Somehow, I manage to love her, and Cline. Maybe there ought to be a mash-up between Cline and Gaga. I suggest combining Cline’s “Crazy” with Lady Gaga’s “Bad Romance,” since they’re basically about the same thing – dysfunctional love. OK, maybe that needs work. 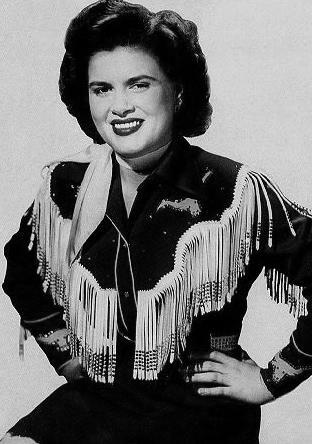 But I’m sure some people out there are far more creative than me, and can come up with a great Patsy Cline/Lady Gaga hybrid. This entry was posted on August 1, 2010 at 12:49 am and is filed under Uncategorized. You can follow any responses to this entry through the RSS 2.0 feed. You can leave a response, or trackback from your own site. I love the way your mind works. Can’t wait for chapter two.